Christmas cookies are the devil. Actually, they often take the shape of angels, trees, Santas and sleighs, but that’s beside the point. 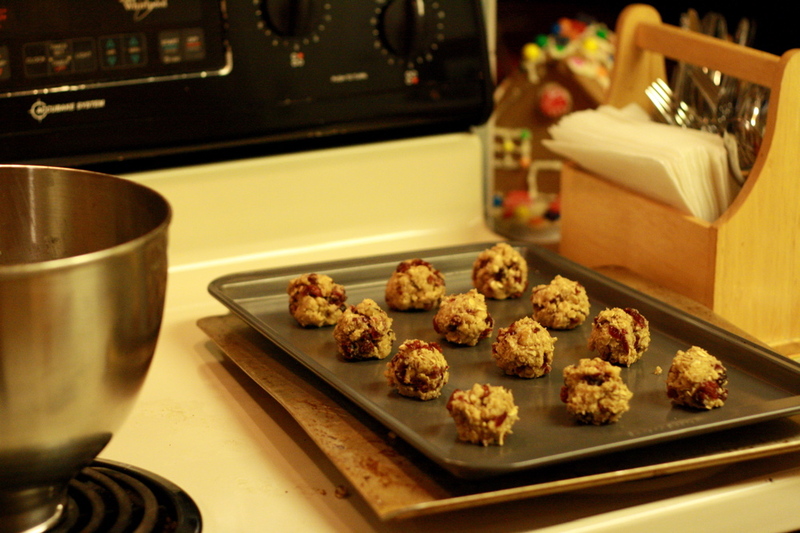 The point is, my kitchen was overpopulated by Christmas cookies this season, and I only have myself to blame. Traditionally, the plan is to make loads upon loads of Christmas cookies and then send them on their merry way to friends and family who live within a 20 minute drive. But this is not what happened this year. Although I fully intended on delivering cookie plates (I do it every year), the cookies didn’t seem to go anywhere but my stomach. My brother and I even forgot to put out cookies and milk for Santa (we still do this every year even though we both know we are only bombarding my mother with the task of chomping down cookies in her half-asleep state). All I’m saying is, very few cookies left my possession, and it has been a very dangerous situation. Actually, since there is still a significant amount of cookies in my kitchen, it’s still a pretty dangerous situation. That being said, things could have been a lot worse. As many of you know, I set out a goal to not gain ANY holiday weight. If it wasn’t for the ferocious Insanity Workout, I’m not sure I would be in the position that I am in today: 5 pounds lighter! I can hardly believe it when I look at the scale, but it’s true. Instead of gaining, I actually lost weight during the Holidays. And I still ate cookies. It seems that the key to losing weight while freely indulging in Christmas cookies is doing the Insanity Workout every night before bed. Since Insanity is so insane, my physical activity outweighed my seasonably excessive caloric intake. I’m sure that being on my feet for 9-hour work days helped too. While I’m not sure if I’ll lose a total of 15 pounds by January 16th, I am very pleased with the success of my primary goal to not gain weight over the course of the Holiday season. I wouldn’t have been able to do it without making the sacrifices I did: 40 minutes of daily insanity, and choosing healthier options when I could. For example, when buying food on my lunch break, I would go for a Jamba Light smoothie from Jamba Juice, or a half turkey sandwich and side salad from the Nordstrom Café. I even incorporated healthier options into my holiday baking. Instead of making Oreo Truffles with the full-fat ingredients, I made them with the lightest ingredients I could find at my local Thriftway. They ended up being 175 calories and 8 grams of fat per truffle. Even so, it was difficult to limit myself to two truffles. Take my experience as a warning. This is probably the simplest recipe I can think of, but I’ll try to make it exciting for you. Combine Oreos and cream cheese in a large bowl. Mix together with a wooden spoon, crunching the Oreos in with the cream cheese (you can also use a Kitchen Aid mixer for this if you have a beater that is strong enough). Stir until the mixture is consolidated and somewhat creamy. It’s okay if there are still a few chunks of Oreo. 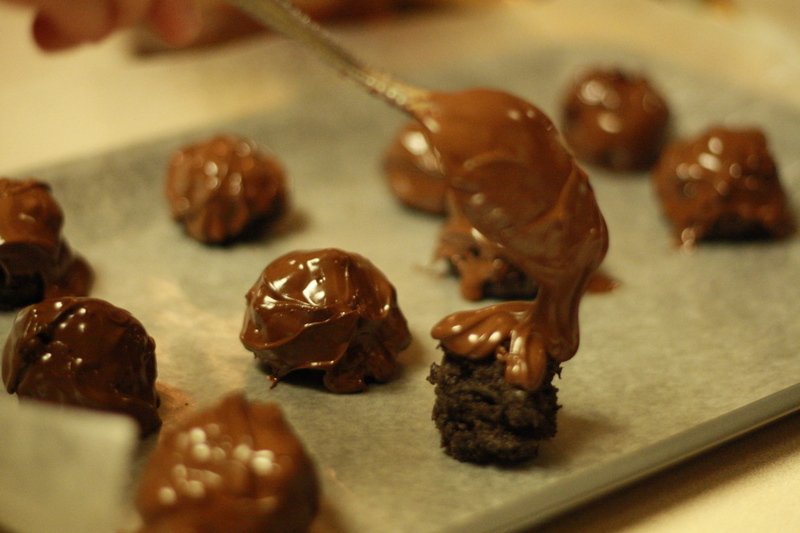 Form Oreo-cream cheese mixture into tablespoon-sized balls and place on cookie sheets. Don’t be afraid to get your hands a little gooey, it’s inevitable. Melt chocolate in a microwave-safe bowl as the package instructs. After the balls are all formed, you have a choice to make. You have the option of either dunking the balls into the chocolate, or using a spoon to pour the chocolate over the Oreo balls. If you choose to dunk them, I would advise refrigerating the balls for about an hour beforehand. I, however, am impatient and prefer to just pour the chocolate on. It’s just easier. After you have chosen your path, you might want to lick all the chocolate off your fingers. That’s usually pretty important. Now, clear out some room in your fridge, and place the truffle-covered cookie sheets in there. Let them sit in the refrigerator until the chocolate is hard and cold, (usually at least an hour). After they’re done hardening, and you’ve eaten a few, it is now time to invite all your friends over so that you don’t have to eat them all by yourself. Believe me, it will be tempting to try.